This entry was posted in Favorite Food and tagged homemade taco, taco, taco ingredients, taco salsa, the best taco on April 13, 2011 by Yami. Last Saturday I had the chance to go out and meet with my friends, thanks to my husband who agreed to stay home to look after the kids while I’m away. I reached Peh’s home safe and sound, thanks to Manong taxi driver for being mindful of his driving. He never asked for a tip, but I gave him anyway. Only Mye, her twin daughters and I made it to the halo-halo party because some of the marces have a previous commitment while the others are miles away or are residing overseas. While we were chatting about a bit of everything – parenting, blogging, and whatnot, Peh is preparing a creamy homemade halo-halo for us. 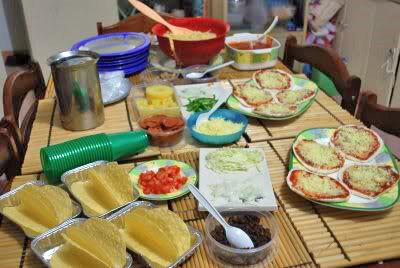 Several minutes after we finished a round of halo-halo, Peh started to bring out all the taco ingredients. 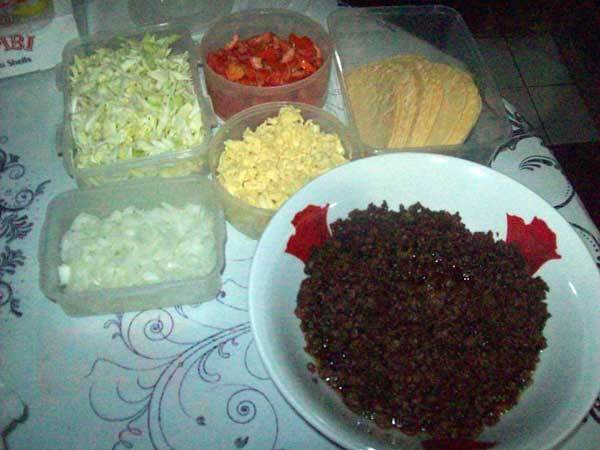 Honestly, I have no idea that taco is easy to prepare and requires minimal ingredients such as taco shell, shredded cabbage, diced tomato and onion, fried ground beef and mccormick’s taco mix and shredded cheese. Peh arranged the ingredients in the taco shell one after the other and placed the tacos inside a microwave oven for a couple of minutes or until the cheese has melted. The tacos taste heavenly I ate two servings in one sitting. I never thought Peh’s homemade taco would taste so good. It’s the best homemade taco I’ve tasted so far. I borrowed this picture from Dishes by Pehpot. Thanks Peh! Before we say our goodbyes, my generous kumare even prepared a boxful of chips with taco salsa for the kids and hubby. Now the kids are begging me to prepare tacos for them. They love Peh’s homemade tacos. It was a memorable weekend for me. I had a great time and hearty laugh with the girls. I could have stayed longer, but it’s getting late and the kids are waiting home for me. The girls (that include the rest of available marces) and I might be seeing each other again next month. This entry was posted in Favorite Food and tagged homemade taco, taco ingredients, taco salsa, the best taco on March 22, 2011 by Yami.